In the late 1970s, Sir James Dyson had the idea of using cyclonic separation to create a vacuum cleaner that would not lose suction as it picked up dirt. He became frustrated with diminishing performance of his electric vacuum cleaner: dust kept clogging the dust bag, reducing suction. After five years and many prototypes, Dyson launched the "G-Force" cleaner in 1983. However, no manufacturer or distributor would handle his product in the UK, as it would disturb the valuable market for replacement dust bags, so Dyson launched it in Japan through catalogue sales. It won the 1991 International Design Fair prize in Japan. Dyson set up his own manufacturing company, Dyson Ltd. In June 1993, he opened his research center and factory in Malmesbury, Wiltshire. Dyson's breakthrough in the UK market more than ten years after the initial idea producing a wide variety of products, including the Air Multiplier fans. 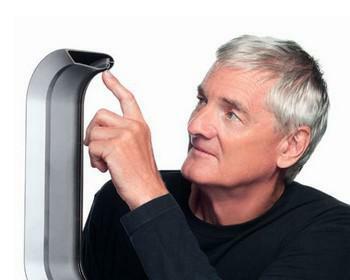 Sir James Dyson was appointed a CBE in the 1996 New Year Honors. In 1997, Dyson was awarded the Prince Phillip Designers Prize. In 2000, he received the Lord Lloyd of Kilgerran Award. He received an Honorary Degree (Doctor of Engineering) from the University of Bath in 2000. In 2005, he was elected a Fellow of The Royal Academy of Engineering. He was appointed a Knight Bachelor in the 2007 New Year Honors. Since 2011 he has been provost of the Royal College of Art.